Morphology, composition and performance of a ceramic filter for household water treatment in Indonesia. Water Practice & Technology Vol 10 No 2 pp 361–370 © IWA Publishing 2015 doi:10.2166/wpt.2015.044. Authors: K. Matthies, H. Bitter, et al. 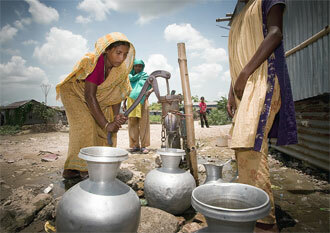 People in rural developing areas often depend on point-of-use water treatment for safe drinking water. A very popular and efficient technology for this is the use of ceramic filters, as promoted by the non-governmental organization Potters for Peace. These filters are already used in many countries worldwide, including Indonesia, where they are manufactured in Bandung, Java by Pelita Indonesia. The filters are made of local clay and combustible material, and coated with silver after firing. However, data available on them are very scarce. The structure, composition, and physico-chemical and microbiological performance of the filter were examined. Pore sizes mostly ranged from 1 to 40 µm and flow rate was about 1.3 L/h. Silver, arsenic and manganese were leaching from the filter in remarkable concentrations. While values for silver were about 0.01–0.02 mg/L, manganese was washed out after a few liters and leaching of arsenic fell below 0.02 mg/L after filtering some liters. With a log reduction of 3–5, efficiency in bacteria reduction was satisfactory in contrast to virus removal which was not sufficient according to the World Health Organization guidelines, with a log reduction below 1.